the birds are singing! the sun is shining! the world awaits our presence! 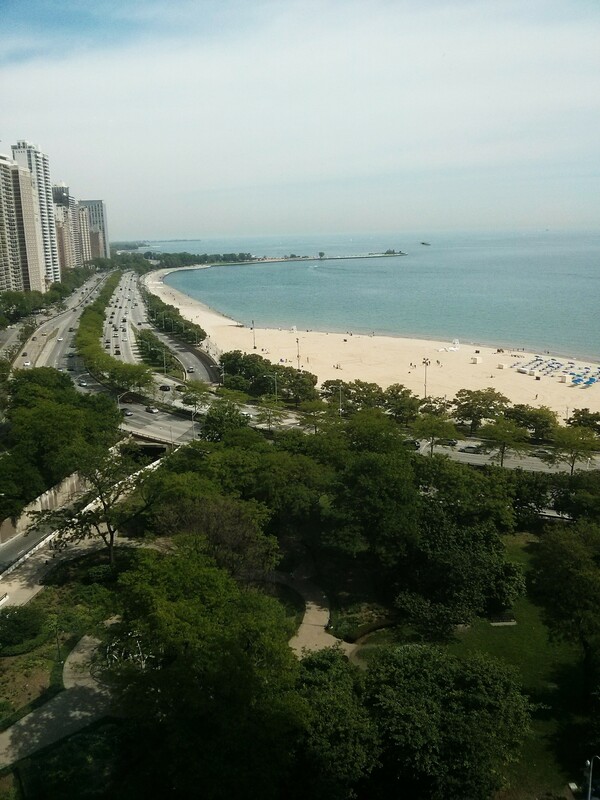 the day looked promising from our corner room on the tenth floor, so kari and i hopped to it for a chicago saturday. we started with refreshing showers, wrapping ourselves in the plush drake robes afterwards. if you’re still thinking of what to get me for my birthday next month, one of these robes might be a good idea…just sayin’! next, we needed a little fuel for the morning, so up to the executive lounge it was. ah, another diamond perk. go, hilton! lots of other guests were there, too, so we snagged some bites of cantaloupe and pineapple and admired the view. quite nice, yes? gregory was running a tad late from the north side of town, so i locked eyes with kari and asked, maybe with a persuasive voice, “michael kors then?” i did the darling eyebrows to convince her completely, and a few steps later we were out the door and in the store, surrounded by all the lush label-ness. 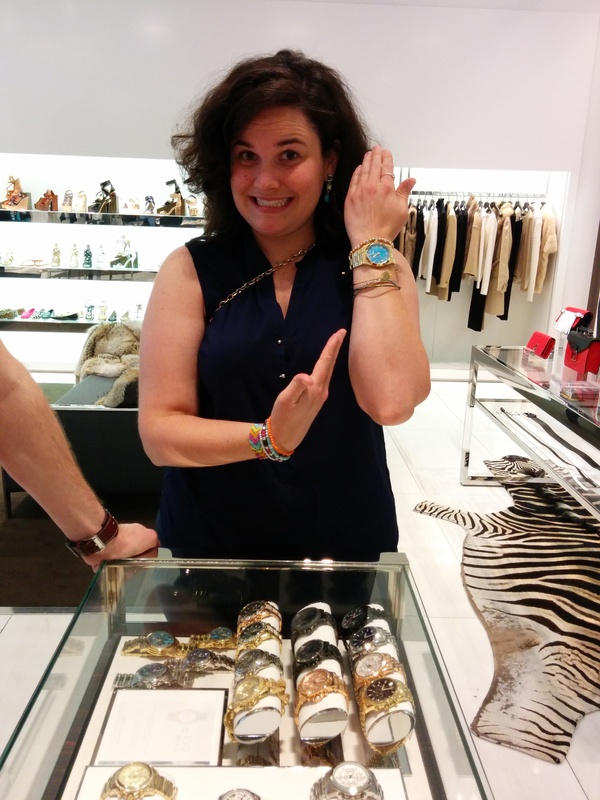 the lovely sales associate marissa was quick to help us, and we just had a ball. i had been eyeing his line of colored dial watches since earlier this year and decided it was time to treat myself. i also took home the rose gold reverse cuff and the gold bead stretch bracelet. it’s a small miracle i didn’t walk out of there with this ring and these earrings. wouldn’t they just be perfect for my look in kyle and kari’s wedding? i think so, too! kari indulged herself as well, giving in to a small dose of peer pressure from yours truly. she strolled out of the store with the blue petite lexington three-hand watch, the rose gold astor buckle bangle, and a double-cross silver bracelet similar to this one. a shopping girl is a happy girl! gregory joined us and we took a right out of the store. the park at the old water tower was just so beautiful that day and the natural colors were just so crisp that i had to capture the moment. all that shopping and walking was getting us hungry, which meant one thing. brunch! i will shamelessly admit that i love brunching. i don’t care how girly a thing it is. it’s just so lovely to relax with a couple of mimosas and eggs and fruit on a deck with some friends. gregory led us to timothy o’toole’s pub. what a great name, right? we bumbled down the stairs, into the darkness, and found ourselves in a rather spacious area, much to our surprise. it felt slightly closed-in simply because it was underground, but besides that, the ambience is exactly what you would expect from your neighborhood irish bar. i told gregory that this spot will be great for sports-watching once football season comes around. go badgers! wait, go dawgs! we wasted no time in ordering our mango and orange juice mimosas. our waiter was quite pleasant throughout our stay there, and the food was satisfying enough. we had ordered the baked goat cheese per his recommendation, but it was simply a bowl of marinara sauce topped with goat cheese and warmed. it will suffice if you are hungry. that is all i will say. our meals came out quickly and were somewhat on par with the appetizer. nothing too special, but they got the job done. the chicago breakfast burrito i ordered was massive. they give you a steak knife to eat it with, it’s so large! i suspect timothy o’toole’s is a spot for drinking and light eating, especially during a game. but, go by and check it out for yourself if you’re in town! last time when we were in chicago, we had tried to go to the top of the willis tower, but the weather was not cooperating. this afternoon, though, really was perfect for this tourist attraction. the tower was constructed across three years back in the 70’s when sears roebuck and company decided they needed some place to house many of their 350,000 employees. architects skidmore, owings, and merrill got to work and eventually created history in the process. the tower is one of the tallest structures in the world and still reigns as the tallest structure in america. the tower, formerly known as the sears tower, was renamed to willis tower when willis group holdings moved into the space in 2009.
this monstrous building was quite an accomplishment, but then u.s. equities got involved to make things even more eye-catching. they led the design and construction of a renovation of skydeck chicago, which included the development of the ledge. the ledge is a large part of what brings people to the tops of this tower, especially drawing those seeking a little thrill. the ledges (there are actually four total) sit on the 103rd floor and extend out from the building, a breathtaking, or terrifying, 1,353 feet above the ground. yikes! we finally wrapped around to the west side of the building, and there they were. the crowd was growing, so we fell in line behind everyone else. i wouldn’t say i have a fear of heights, but all i could think while we were on that ledge was, “what would my screams sounds like if the floor fell out from beneath us at this very moment?” yes, a bit morbid. but, do not fear! the ledges held up for us as well, and kari was able to snap a few pictures so we could remember the moment. we were exhilarated from our dare-devil acts! where to next? there was nothing we couldn’t do! well, celebration was in order, so we moseyed back to the drake and popped open the bottle of wine gregory had so kindly left for us at the check-in desk. who doesn’t like a good glass of chilled pinot grigio? the afternoon was slipping away, the evening right on its heels. the show didn’t start until 7:30 that night, so we had just enough time for a casual dinner first. we spruced ourselves up and grabbed a few seats on the city bus. it took us near the lincoln park zoo, where we departed and walked a few blocks to ranalli’s, one of gregory’s favorite spots. he had raved about the bbq chicken pizza, and with four dollar mimosas that night, you can bet we were all in for it. i started with the small caesar salad because, you know, i hadn’t had anything of nutritional value in several days. 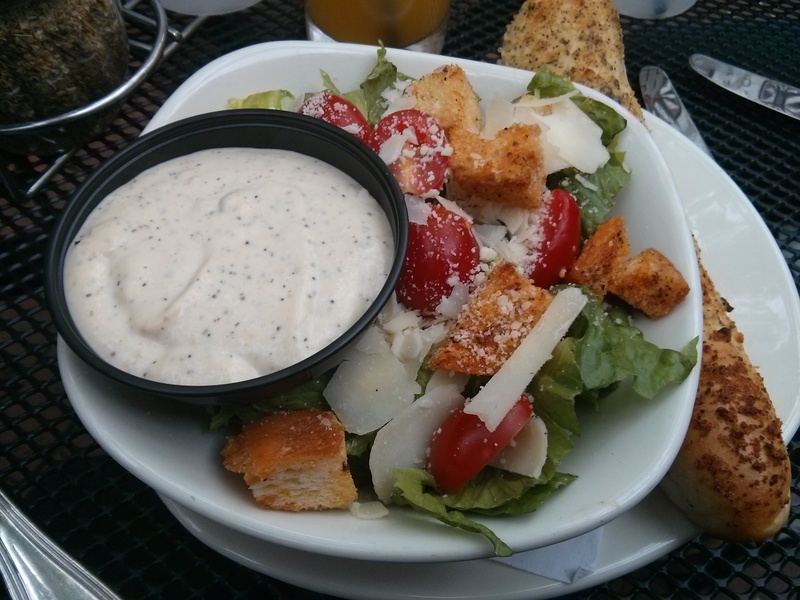 the homemade dressing was creamy and flavorful; it didn’t take me long to scarf it down. kair and i stuck with mimosas that night, but gregory figured a cheap pitcher of miller was the way to go. bottoms up, gregory! soon enough the food came to cover the tabletop, and we dug in. kari kind of deconstructed the chicken parmesan sandwich she ordered, only because there was just so much bread on that thing. gregory nearly inhaled the 22 burger he ordered. and i will admit, it looked delicious! except for the poblano peppers, which probably would have been too spicy for me. 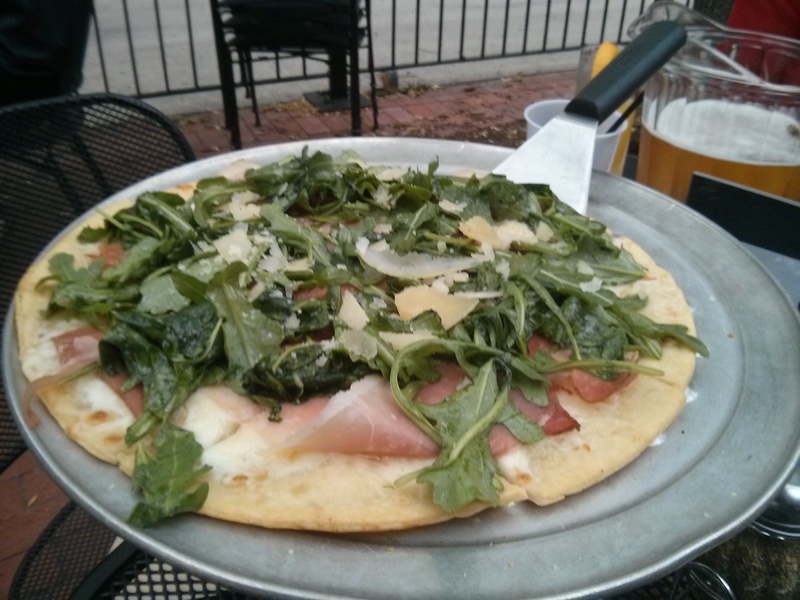 i figured pizza at a pizza place couldn’t be a bad choice, so i dined on the prosciutto and arugula thin crust. oh heavens, it hit the spot! the arugula wasn’t too bitter, and the salt from the prosciutto was nicely balanced by the rich mozzarella. had i had room, i would have polished the whole thing off myself! two thumbs up! so, earlier i had mentioned the show. what show? what is it you are going to see, kelsey? well, let me tell you. artist jamie cullum is someone i have been a fan of for nearly ten years now. if you do not already know, i first unexpectedly, and pleasantly, discovered him in a birmingham best buy one day. ever since then, i have seen him in concert several times and am always excited about his new album releases. well, when i saw he wasn’t coming to atlanta for his u.s. momentum tour this year, i figured i’d go to him! what better opportunity to see friends and see jamie cullum in concert than coming to chicago! 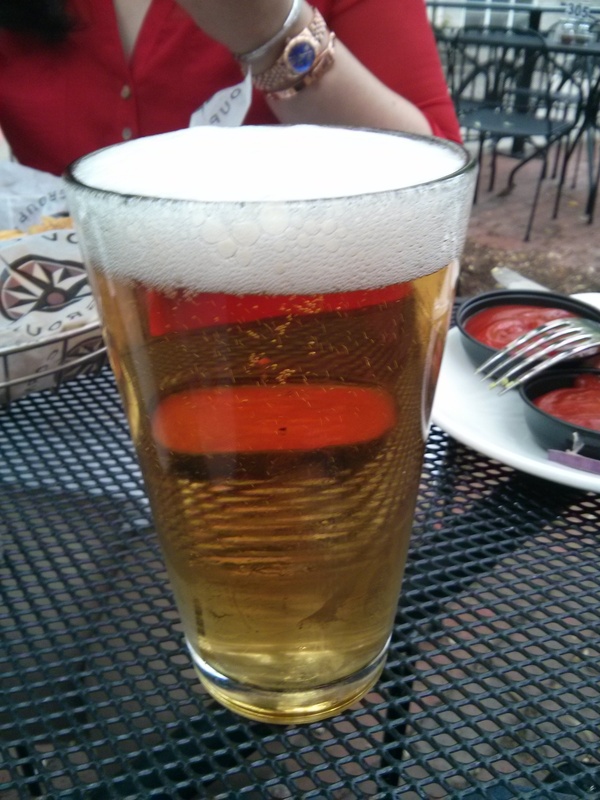 kari and i left gregory with his half-full pitcher of beer and hustled to park west. the opening act was still on, so we had arrived just in time. since the floor level was already packed, we climbed the balcony stairs and found plenty of open stools along the back wall. although it would have been great to have been front and center, our seats were actually pretty great for the show. we could see everyone and everything, and taking it all in as he closed the show with “mixtape” was awesome. bravo, jamie, bravo! although the show was over, the night was far from finished. kari and i met up with gregory and his roommate ben at wells on wells, just down north wells. the bouncer checked our id’s, and we showed ourselves to the back patio. we found a table under the awning to protect us from the soft rain that had just begun to fall. the waitress, who seemed to be having a less than enjoyable night, reluctantly lit the candles on our table and brought us a pitcher of beer. kari and i were just starting to recount the concert to the boys as the rain started coming down harder. they closed the patio and ushered us inside. oh well. we can have a good time nearly anywhere. 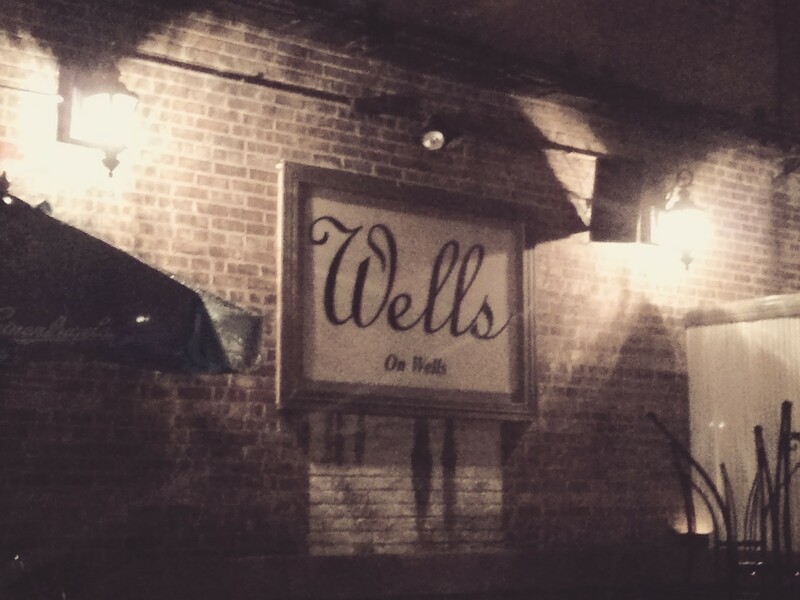 thanks to the modern-day jukebox in the corner, we immensely enjoyed our time at wells on wells. we played “wagon wheel” for me, “pretty girl rock” for kari, “started from the bottom” for gregory, and “ignition remix” for ben. i don’t know if it’s true, but i’m convinced we were having the most fun out of anyone there that night. wells on wells was closing down, but there was still so much fun to be had! we dodged the raindrops and slipped into corcoran’s, just next door. the atmosphere here wasn’t nearly as upbeat, and we only stayed for one drink. i’ll say, though, the kamikaze shots kari and i had were quite delicious! speaking of delicious, 3:00 a.m. is a great time of the day to grab a great bite of food. the skies were pouring down on us, now, so we all bolted for elly’s pancake house a couple blocks away. pancakes always make for a good drinking meal. we were promptly seated and instantly warmed, as things outside had gotten chilly! i promise i will come back to elly’s during normal hours on another day because from what i remember, the place was just so darn cute! definitely a spot where i would become a regular. ben and i both got pancakes that were stacked high and generously covered in chocolate chips. i think gregory had blueberry pancakes? i cannot recall with certainty, as he ate them as though he hadn’t eaten in days. kari had the thick french toast that was also gone in nearly no time at all. 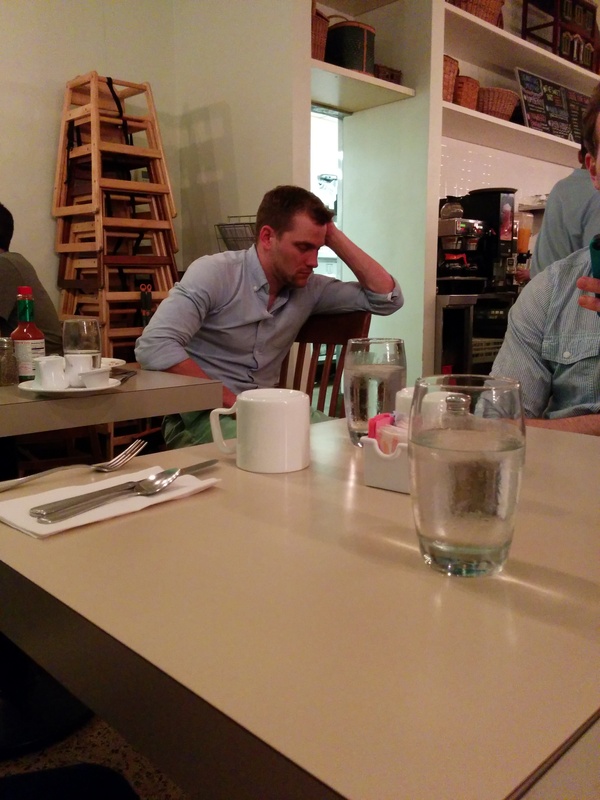 after placing our orders, gregory and i caught glimpse of the biscuits and gravy on the table next to us. we assuredly decided we needed a plate, too. so even with the great amounts of food that had already found their way to us, we beckoned the waiter for biscuits and gravy as well. the plate arrived, and gregory quickly snuck a bite with his spoon. he looks like he enjoyed it, yes? before i wrap things up for the night, i have to give a shoutout to the ultimate late-night man. this fella was at the table next to us, “holding” conversation with a young lady who was way too awake and way too sober for this time of the day. when she excused herself to the ladies’ room, the poor guy fell asleep! i don’t know how discreet kari was when she snapped this picture, but isn’t it just grand? shortly after our fourth meal, the boys headed back uptown, and i beckoned an uber x ride to carry kari and i home. chicago is a city i can say, now, that i do love. you can bet i’ll be back, and you can bet i’ll have just as many fun stories to share next time. Haha, thanks, Michael! P.S. Congratulations to the Spurs!